As a versatile performer of opera, musical theatre, and concert work, I love passing my knowledge and passion for singing on to my students. I began my musical career with a brief stint on the violin at age seven, followed by ten years of piano lessons (which, to be honest, I sometimes wanted to quit, but am grateful that my parents insisted I persist), and, finally, voice lessons. My first voice teacher, an accomplished opera singer and professor at our state university, also happened to be my best friend's mom. While we were running around outside as children, I could hear the sound of voice lessons coming through the windows from inside their house, never guessing that one day that would be me. When people ask when it was I knew I wanted to study voice, I'm honestly not sure how to answer. It seemed like a given, an obvious decision. I loved performing, and voice was my strongest asset. For college I found myself at the Oberlin Conservatory of Music, one of the top music schools in the country, where I received a truly excellent education. After graduating, I immediately moved on to earn a Master of Music and then moved to Boston. I began teaching as soon as I finished school. 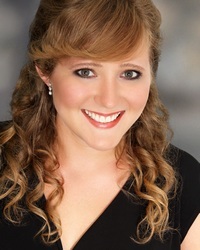 I am an active performer in the Boston area and have sung with companies including Boston Opera Collaborative, Opera del West, Mass Opera, Reagle Music Theatre, and Masterworks Chorale. I have also been featured as a Young Artist in several summer festivals including Pittsburgh Festival Opera, the American Institute of Musical Studies (AIMS) in Graz, Austria, CoOPERAtive in Princeton, New Jersey, and Oberlin in Italy in Arezzo, Italy. In addition to teaching my students a healthy singing technique and building a variety of repertoire, we work on sight reading, aural training, and note-reading. My students learn music from multiple genres, depending on their interests, everything from classical music in different languages to musical theatre to popular music. I tailor my lessons to fit the individual student's needs, abilities, and goals, making each lesson the most beneficial for every student. My teaching philosophy is to foster a love for and appreciation of music in all of my students, and promote their individual musical and intellectual growth.